Edgar Whitby was born in Yeovil in 1890. He was the son of wool merchant George Henry Whitby (1854-1935) and Rosa Meech née Hardy. Edgar was the grandson of bookseller Ebenezer Whitby. George and Rosa's children were George B (b1885), Arnold S (b1887), Lilian M (b1889) and Edgar. 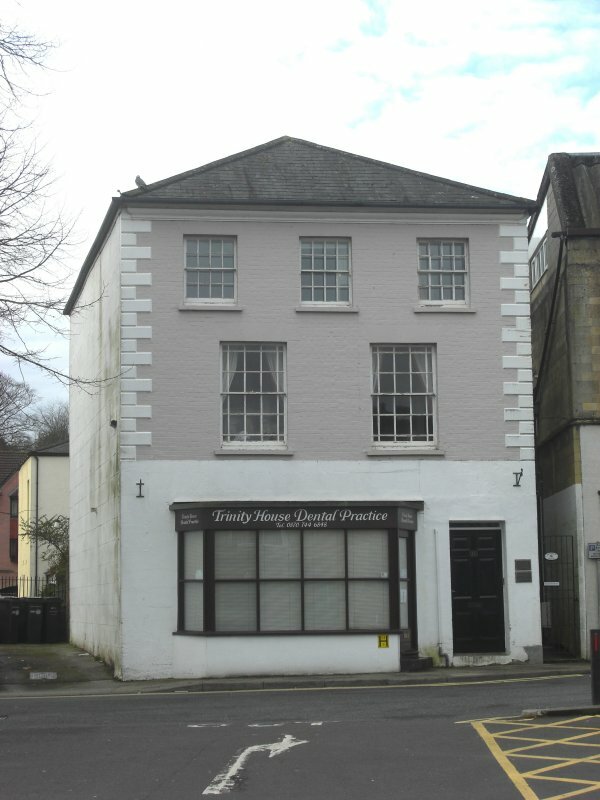 In the 1891 census the family were living in Trinity House in Peter Street and were at the same house in 1901 and 1911. In the 1911 census 21-year old Edgar gave his occupation as an estate agent's clerk. Edgar enlisted at Cheltenham, joining the 10th (Service) Battalion, Gloucestershire Regiment. His Service Number 25590 suggesting that he enlisted at the end of 1915 or the beginning of 1916. The 10th Battalion, Gloucestershire Regiment was raised at Bristol in September 1914 as part of Kitchener's Third New Army and was attached to to 26th Division. They proceeded to France on 8 August 1915 and joined 1st Brigade, 1st Division, on 17 August 1915. They first saw action in The Battle of Loos. In 1916 they were in action in the Battles of the Somme. Edgar Whitby was killed in action on 23 July 1916. He was aged 26. 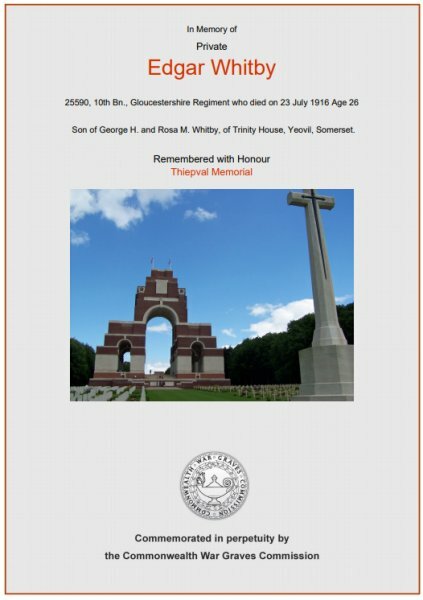 The Western Gazette, in its edition of 11 May 1917, reported "Mr and Mrs GH Whitby, of Trinity House, Yeovil, have received official notification from the War Office, that their youngest son, Private Edgar Whitby, of the Gloucester Regt., has been killed. During the fighting in France on July 23rd 1916, he was reported to be missing, but after every enquiry had been made, the War Office regretted to report that he had been killed. Private Whitby was sent to the Front shortly after joining his regiment. Much sympathy is expressed for the parents." William is commemorated on the Pier and Face 5A and 5B of the Thiepval Memorial, Somme, France, and his name is recorded on the War Memorial in the Borough. Trinity House on the south side of Peter Street, the home of the Whitby family and where Edgar was probably born. Photographed in 2016. The Commonwealth War Graves Commission certificate in memory of Edgar Whitby.